If you're like me, you may have the data you want to put into your Google Calendar stored in some other format. For example, I already have some widgets with calendar-related information in them, and I need to be able to create Google Calendars by importing that information all at once. 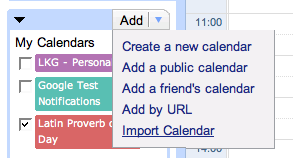 Luckily, you can do that using the Google Calendar Import feature. For your convenience, I've created a Google Calendar Import Spreadsheet you can use as a template. You can save this to your desktop, import it into your Google Documents (or open it in Excel, etc. ), edit it, and export it as a CSV file. When you have completed your file, here is how you import the events into a calendar. First, make sure you have created the calendar into which you will import the events. Then, click on the Add-Import Calendar option. You can then browse to find and upload the CSV file of events you have created on your computer, and designate the calendar you want to use. Be careful. There is no "undo" option for the import. If you accidentally import the events into the wrong calendar, or import them twice into the same calendar, there is no way to mass remove the events. You have to remove them one at a time - so be careful! Required fields. Every event needs a Subject, a Start Date and a Start Time. Other than that, all fields are optional and can be safely left blank. Private/Public. If these events are for a calendar you want to share, make sure you make the Private field as FALSE for each event. That way you can be sure that each event you are adding will be publicly available. You can use HTML in the Description. I've been able to create link sin the Description field using HTML. I'm not sure just how much HTML is allowed in the Description field (I could not find documentation for that online), but I was able to successfully include A HREF tags to create active links in the description for an event. Some dynamic content may not display if you are reading this blog via RSS or through an email subscription. You can always visit the How-To Tech Tips blog to see the full content, and to find out how to subscribe to the latest posts.